March 25, 1942: More dance rehearsals for For Me And My Gal. Time called: 1:00 p.m.; dismissed: 5:00 p.m.
March 25, 1943: Filming continued on Girl Crazy on the “Interior Governor’s Waiting Room” and “Interior Governor’s Office” sets. Time called: 10:00 a.m.; dismissed: 5:45 p.m.
March 25, 1944: Filming continued on Meet Me In St. Louis on the “Interior Dining Room” set. 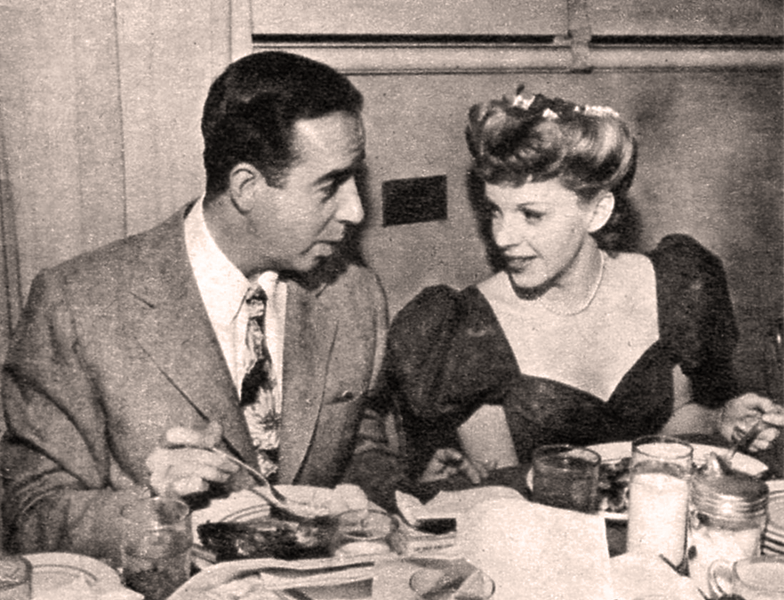 Time called: 10:00 a.m.; Judy was ready at 10:55 a.m.; dismissed: 5:50 p.m.
Photo: Judy and director Vincente Minnelli enjoy a break in filming at the MGM commissary. Judy’s in her “Have Yourself A Merry Little Christmas” gown and wig. Photo provided by Kim Lundgreen. Thanks, Kim! 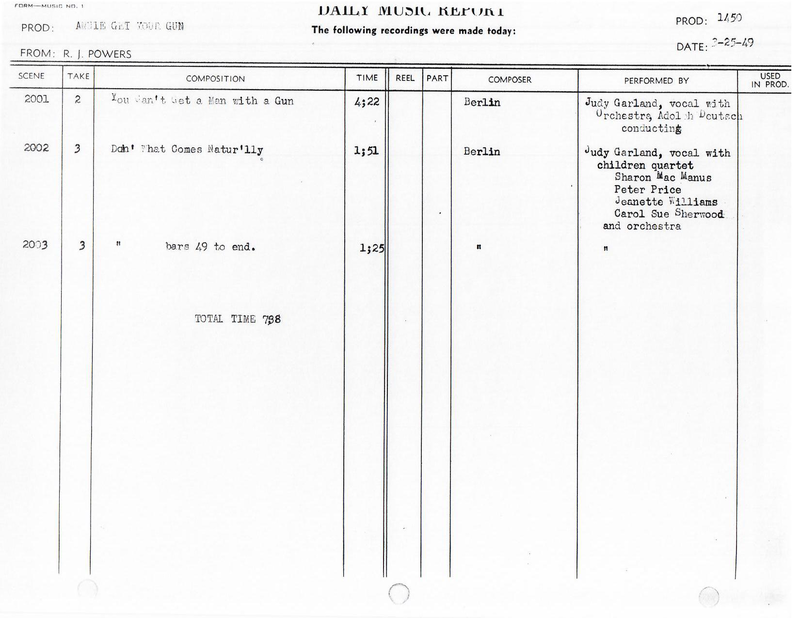 March 25, 1949: The first recording session for Annie Get Your Gun. Judy pre-recorded “Doin’ What Comes Natur’lly” and “You Can’t Get A Man With A Gun.” Judy arrived at 1:30 p.m. and was dismissed at 3:15 p.m. 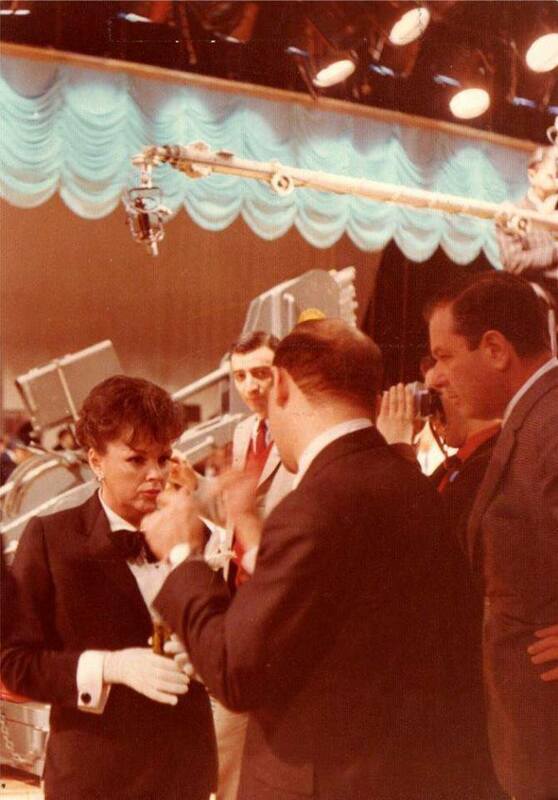 The pre-recordings for Annie remained in the MGM vaults for years, until “You Can’t Get A Man With A Gun” was released, without explanation that it was an outtake, by MGM Records in 1962 on the compilation LP “The Judy Garland Story – The Hollywood Years” which as a follow-up to “The Judy Garland Story – The Star Years” released the previous year. This is the first time MGM Records released some of Garland’s pre-soundtrack album performances, most taken directly from the film soundtracks. What is interesting is that along with the Annie outtake the album also included another unexplained outtake recording: “Bei Mir Bist Du Schoen” originally intended for Love Finds Andy Hardy (1938). The “Annie” pre-recordings began to pop up on bootleg LPs in the late 1960s and into the 1980s. The remastered pre-recordings finally appeared in 1996 on the “Judy Garland – Collector’s Gems from the MGM Films” and the complete Annie soundtracks (both the Garland and Betty Hutton versions) appeared on the 2000 CD premiere release of the film’s soundtrack. March 25, 1954: A rough cut of A Star Is Born was screened at Warner Bros. for Judy, co-star James Mason, director George Cukor, Warner studio chief Jack Warner, producer (and Judy’s husband) Sid Luft, and other members of the production. All involved considered it a success. March 25, 1955: Judy on the cover of Italy’s “Cinema Nuovo” magazine. 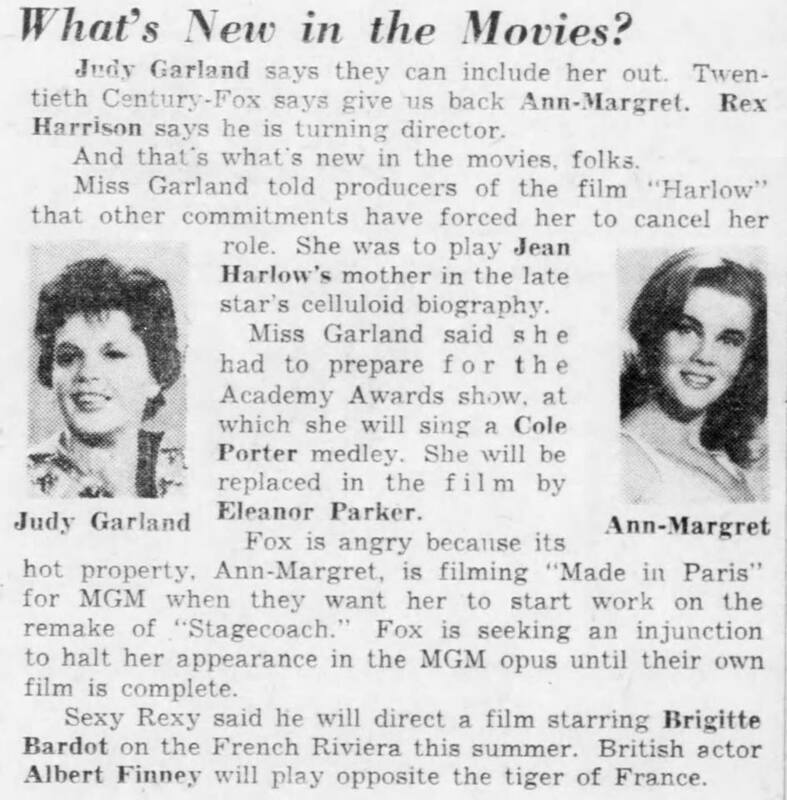 March 25, 1958: Columnist Dorothy Kilgallen reported that Judy had guards posted ’round-the-clock at the home she was renting during her Town and Country engagement. The reason was because of her recent legal battles with husband Sid Luft. March 25, 1963: Here is the seventh article in a series of articles, each about a different star, written by the legendary Hollywood columnist Hedda Hopper. This installment focuses on Judy’s mom, Ethel, and her ambitions for her youngest daughter. 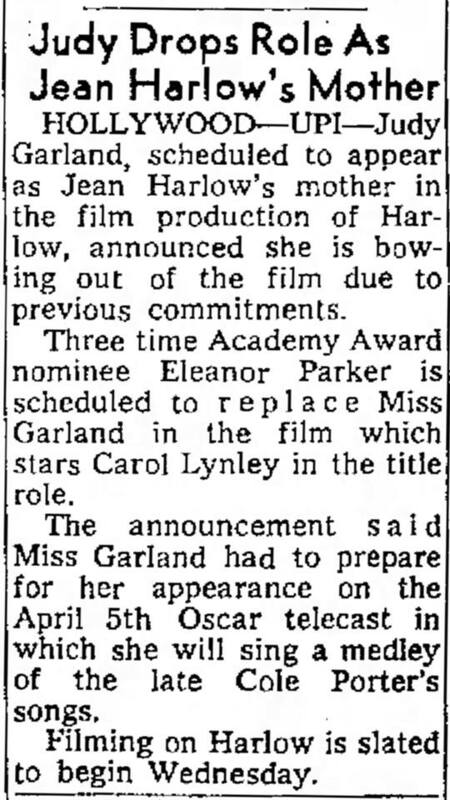 March 25, 1965: Judy’s short association with the film Harlow came to an end, as noted in papers around the country. As with Valley of the Dolls two years later, Judy dodged a bullet on this one! It’s a shame that both films about Jean Harlow were so bad. Harlow was a wonderful star, a good comedienne and actress, and gone too soon. She deserved better. 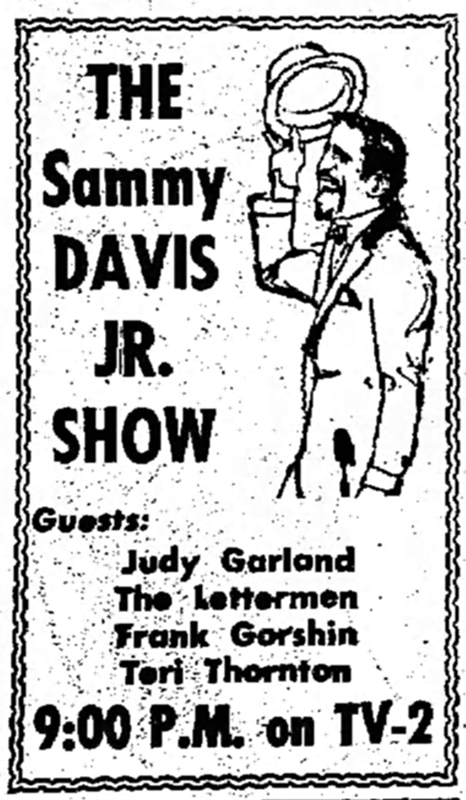 March 25, 1966: NBC-TV aired Judy’s second appearance on “The Sammy Davis, Jr. Show.” The show was taped on March 6, 1966, at the NBC Studios in Brooklyn, NY. 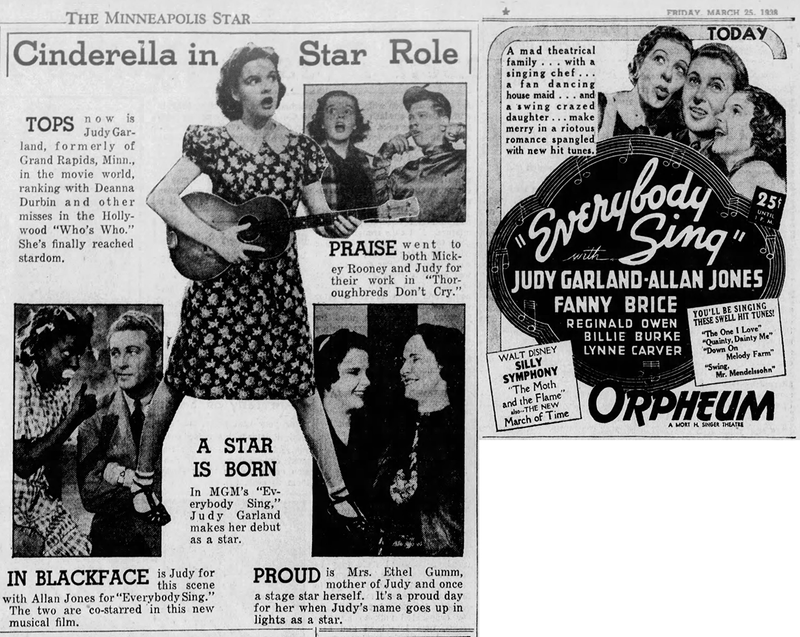 Judy sang: “Almost Like Being In Love”/”This Can’t Be Love”; “If Love Were All”; and “Love.” The last two were cut before airing although recordings taken from the sound system that still survive. Judy also performed a medley with Davis. Although it was filmed in color, only B&W footage survives. March 25, 1969: Judy gave her final concert at The Falkoner Centre in Copenhagen, Denmark. 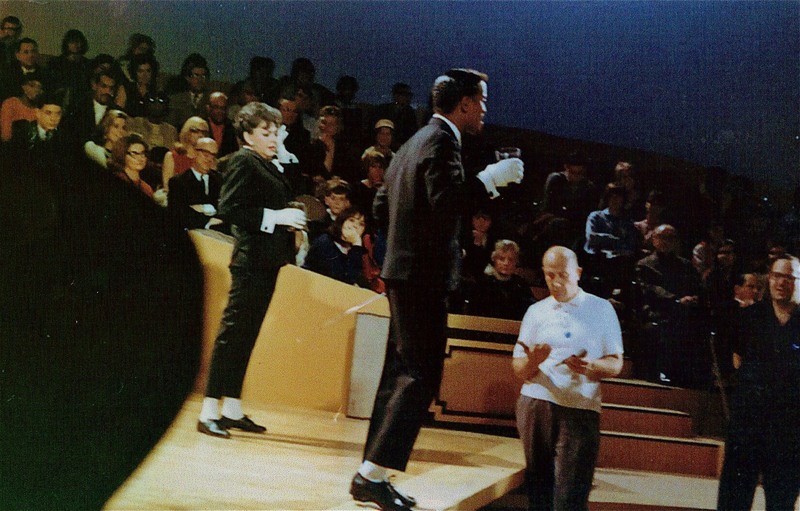 As with the rest of the concerts on this short Scandinavian tour, Judy was joined by singer Johnny Ray. The twenty-nine piece orchestra was conducted by Tony Osborne. The 1,100-seat theater was sold out at a record 125 kroner each (about $18). Photo’s provided by Kim Lundgreen. Thanks, Kim! March 25, 1969: “Am I Blue?” (above) and “Till The Clouds Roll By” (below) (duets with Johnnie Ray). These two rare Copenhagen live performances were recorded on March 25, 1969. The videos feature the recordings restored and remastered by John H. Haley. In 2015, a recording of Judy’s concert at the Falkoner Center in Copenhagen was released in what was then believed to be complete having been sourced from an excellent sounding radio station tape. The concert had been taped for broadcast several days later. Since the release of that CD set, amazingly, another tape of this same concert surfaced, made by the concert hall itself. This second tape is unrelated to the broadcast and is in equally fine sound as that first tape. From this newly discovered hall tape, we know definitively that the first half of the evening was a performance by pop singer and Garland friend Johnny Ray, with Garland appearing on the second half of the concert. 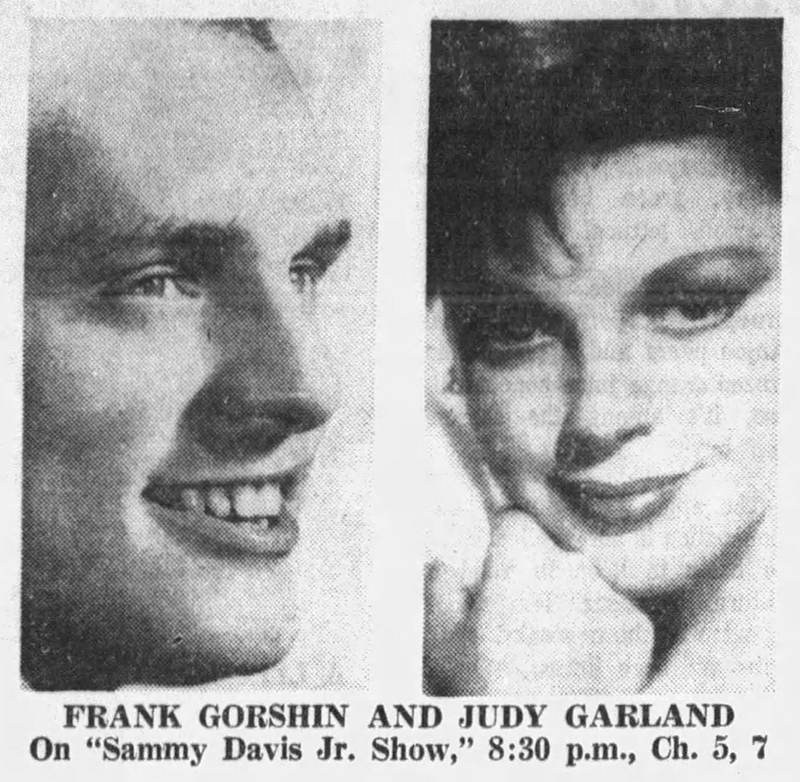 We also now know that the radio station eliminated two duets, “Till The Clouds Roll By” and “Am I Blue,” in which Judy was joined by Ray, who also accompanied both himself and Garland at the piano. These duets occurred right after the number “Chicago” on the program, before Garland concluded the concert with “San Francisco” and “Over the Rainbow.” If there were any encores thereafter, they are undocumented and are not preserved on any known tape. A 1993 CD release contains similar duets with Johnny Ray, taken from other performances. “Am I Blue” on that set is identified as being from a rehearsal when in fact it was an impromptu performance by Garland and Ray at a piano with friends. “Till The Clouds Roll By” on that set is from the March 23, 1969, performance on the same tour in Malmö, Sweden. A film was being made during the tour, some of which can be seen on YouTube. These video pieces present Garland and Ray performing “Till the Clouds Roll By” in concert in Malmö, despite some mislabeling as being from the Copenhagen concert. The video of “Am I Blue” shows a piano bar setting (matching the audio noted on the previous screen) that is clearly not the Copenhagen performance. In these video clips, the soundtrack to both duets is exactly the same as what is heard on that 1993 Legend CD. They are completely different from the two tapes of the Copenhagen concert. In other words, the CD also mislabels the Malmö recordings as Copenhagen. The Judy Room is thrilled to confirm that these duets as performed in Copenhagen have never been released before and are in fact genuine new Garland discoveries. They are well performed, with the first duet, “Till the Clouds Roll By,” having the character of something like a spontaneous jam session. “Am I Blue” is sung mostly by Garland, beautifully and unforgettably, as Ray requested of her before they started. Both duets are enhanced by Ray’s beautiful piano accompaniments. The entertaining banter with the audience and between the performers before each duet is also included in full, making us feel even more like members of that 1969 audience as we listen. These excerpts are part of the very last public performance that Judy Garland gave on any stage. 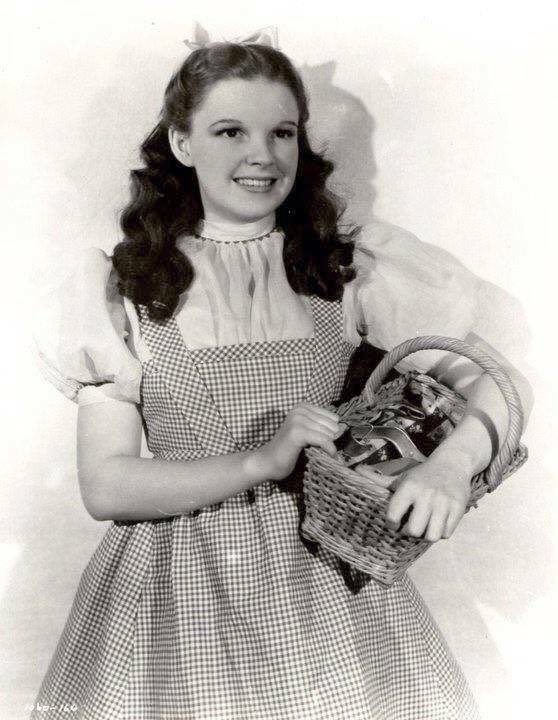 Listen and be held again in Judy Garland’s hand as she works her magic spell on the audience, and by extension, us lucky listeners many decades later. Read John Haley’s detailed notes here (PDF). Happy to hear that a new tape was discovered from the Copenhagen concert recorded by the concert hall itself with added songs, Til the Clouds Roll By, and “Am I Blue”. Hopefully Lawrence Schulman and his team can work on getting it released on a future CD release!